A vehicle’s transmission, both automatic and manual, is very expensive to replace, especially if you are opting for a new one. Luckily, if it is not completely damaged, some parts may be replaced – termed as transmission rebuild. During this method, damaged parts will be replaced with a new or a used one to make it work once again. In some instances, new transmissions may no longer be acquired especially if you own an old vehicle model as most manufacturers halt production at a particular period of time. It is also a cheaper option but the performance is as good as a new one. One way to find replacement parts is by visiting a reputable salvage yard that sells perfectly working transmission parts at reasonable prices. A reputable car mechanic can accompany you in finding the best parts to rebuild your transmission. New York Auto Salvage & Glass, a renowned auto salvage vehicle in New York, has a wide selection of parts that are thoroughly checked to ensure that these will work well on your particular type of transmission. Our in-house mechanics ensure that all our second-hand parts have gone through rigid assessment as we value clients’ safety and satisfaction. We also make sure that these are free from any grime accumulation. Visit us today! 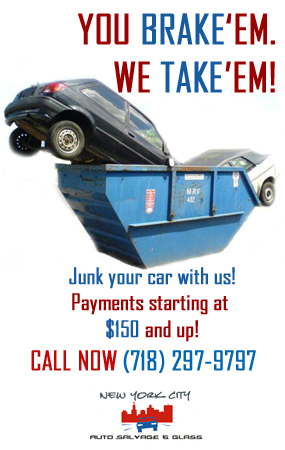 New York Auto Salvage & Glass is located in in 148-36, Liberty Ave, Jamaica, New York. It is surely our pleasure to help you towards rebuilding your damaged transmission without emptying your pocket. We are open every day from 8:00 AM to 6: PM. It is always our pleasure to serve you.